By now, you’ve probably heard the bad news about how too much sitting can negatively affect your health. Therefore, you’re looking towards welcoming a standing desk into your life. However, you’re wondering “is there more to know?” Do you just…start standing? Jumping into anything without the right preparation and research can cause problems. This post will give you the basics on standing desks and will show you how to make the most of your new office tool. While there’s a lot of agreement on the dangers of too much sitting, there are no hard and fast rules about how much you should stand. What everyone does agree on, though, is that it’s best to start slowly. Stand until your feet (or back, or legs) get tired, and gradually build your standing time. Try not to sit more than 30 minutes at a stretch and make sure when you do sit, it’s on an ergonomic chair. Overall, you should aim to stand for at least 2 hours out of an 8-hour workday. 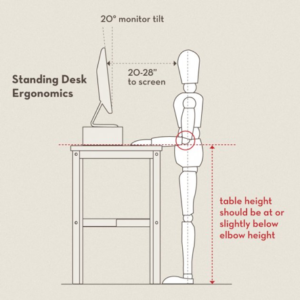 What’s the correct height for a standing desk? Set your monitor at eye level so that you’re not tilting your head up or down while you work. A monitor arm is a handy tool for this — and easier to adjust than a stack of printer paper. Read more about standing desk tips here and then talk to a Source Furniture Specialist about our standing desk options. Our electric and hand-crank options come in a variety of finishes, and they’ll all get your on your way to a healthier work day. Source Office Furnishings — Making Your Office Work Better!